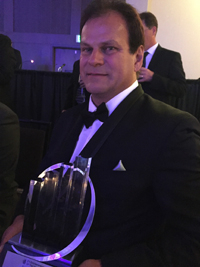 Dennis Brazier, CEO and founder of mower manufacturer Altoz, was named one of the winners of the EY Entrepreneur Of The Year 2016 Upper Midwest Award. These entrepreneurs were selected by an independent judging panel made up of previous winners of the award, leading CEOs, private capital investors and other regional business leaders. Regional award winners are eligible for consideration for the EY Entrepreneur Of The Year national program. The Davey Tree Expert Co. promoted Doak Marasco to manager of strategic partnerships of the national business development team in the Northeast region. In 12 years with Davey, Marasco served as a field inventory arborist, crew leader, project manager and operations manager. Most recently, he assisted the national business development team in New York and New England. Marasco earned his bachelor’s in forest science from the Pennsylvania State University in 2003 and the Davey Institute of Tree Sciences in 2007. Davey also promoted Karen Wise to division manager of Midwest natural resource consulting for Davey Resource Group. Wise joined the Davey Resource Group in 1997 as a wetland scientist. Since then, she’s served as a wetland section leader, department manager and manager of ecological service and Eastern urban forestry. Most recently, she was operations manager of Davey Resource Group’s natural resource consulting team. She has a bachelor’s in biology from Wheeling Jesuit College and a master’s in natural resources from The Ohio State University. Ruppert Landscape, located in Laytonsvillle, Md., hired James Thompson as chief financial officer, with oversight of the accounting and information technology departments. Thompson brings more 20 years of finance, accounting and treasury experience to his position, having most recently served as vice president of global finance, accounting, treasury and purchasing for United States Pharmacopeia. He is a Certified Public Accountant and holds a Master of Business Administration from Southern Illinois University, Edwardsville and a Bachelor of Science in accounting from The University of Texas at San Antonio. Takeuchi-US transitioned Hampton Wideman to the position of western regional business manager, effective June 1. Wideman was the southwest regional business manager for the past two years. The lateral move is, in part, to bring more experience to the territory and to further develop dealer relations.